Giving your kitchen a makeover is notorious for being expensive. However, with new design ideas and cheaper options, it does not have to be one of those things you keep saving up for. 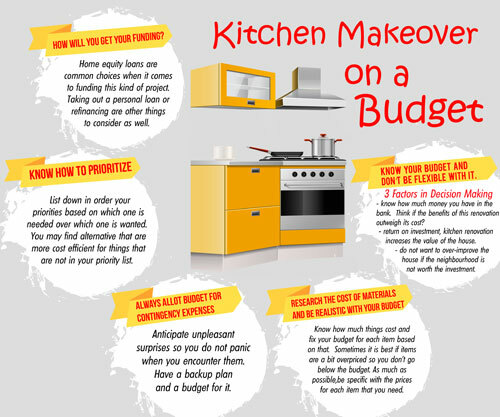 Here are some tips on how to go through kitchen makeover on a budget. Know your budget and don’t be flexible with it. According to experts in home renovation, the average cost of an upscale kitchen renovation is at least $80,000. With the number of zeros in that figure, you definitely need to think about whether you want to spend that much or not. There are three factors that should play a part in your decision. One is whether or not you can afford it. The other is what you plan to do with the house in the next five years. Finally, take a look around and consider your neighbourhood. The first factor is obvious. You want to know how much money you have in the bank. If you use a certain amount, will you have enough to spend in case of emergencies? Will the benefits of this renovation outweigh its cost? These are practical questions that are worth investigating. The second factor has a lot to do with return on investment. If you are planning to move in the next five years, then a kitchen renovation increases the value of the house. On the other hand, if you plan on staying for more than five years in the same house, you should go for remodelling that will make your stay more comfortable. The last factor is one that a lot of people do not think about. The kind of neighbourhood you live in determines the value of your property. An upscale neighbourhood will always be much more expensive than a modest one. This is why you do not want to over-improve the house if the neighbourhood is not worth the investment. For example, a very fancy looking kitchen in a middle-class neighbourhood is not a good investment. In the event that you sell the house, the cost of your renovation will not affect the total value of the property. Know how much things cost and fix your budget for each item based on that. Sometimes it is best if items are a bit overpriced so you don’t go below the budget. As much as possible, be specific with the prices for each item that you need. There will always be circumstances that are outside of your control and a contingency plan may be needed. Anticipate unpleasant surprises so you do not panic when you encounter them. Have a backup plan and a budget for it. Reality is that you cannot get everything you want when you have a limited budget. There may be things that you have to prioritize more compared to others. List down in order your priorities based on which one is needed over which one is wanted. Another way of looking at this is that you may find alternative that are more cost efficient for things that are not in your priority list. How will you get your funding? Home equity loans are common choices when it comes to funding this kind of project. Taking out a personal loan or refinancing are other things to consider as well. Kitchen remodelling is a great project, but it should be done with an informed financial decision.